Municipal511 is changing the way road information is communicated and managed. Municipal511 is being adopted county wide, with county, towns, townships and cities creating a complete picture of all road obstructions, restrictions and cautions on their municipal roads. To complete the picture, Transnomis captures and presents provincial highway information with the municipal road information. With Municipal511, public works are able to identify project conflicts before they happen. Emergency responders benefit from a real time map of obstructions on their routes. The public (and industry) receive authoritative road information in the popular navigation applications they use. Municipal511 is a comprehensive map-based road information management and communications web application. Communications channels include a common public map (www.Municipal511.ca), data feeds to leading navigation applications, and emails with mapped locations. The web app supports mobile and desktop environments, without having to install software. Municipal511 can be personalized with the addition of private map layers, data integrations, online permits and variable message sign services. Most Municipal511 clients also purchase Responder511. Time saved communicating and mapping road issue and event information. Reduced road work and event scheduling conflicts, within and across jurisdictions. Stakeholder (including public) satisfaction viewing information from all levels of government in one place, and a popular consumer navigation app. Road issues are presented on the map with an icon that reflects the roadwork, incident, condition, etc. type. 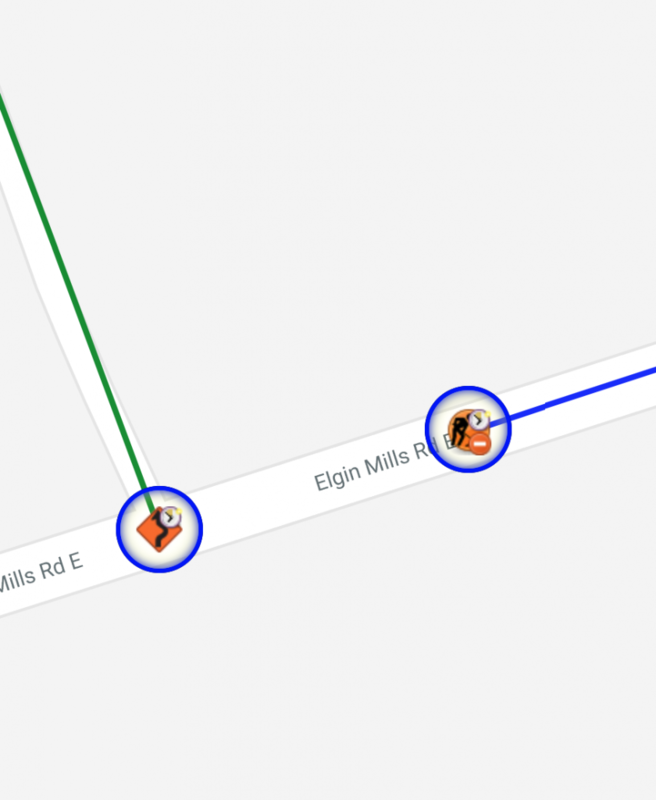 Clients are encouraged to add additional attributes to their road issues, which are presented as secondary icons. E.g. “Road Closed – No Emergency Access” will display a red road closure sub-icon.Road issues posted for the future include a sub-icon that indicates it is in the future. The public map at www.Municipal511.ca presents future issues for the 7 days in advance of the start time. Within the client application, future issues can be turned on and off. The latest issues can be highlighted. Road issues can be posted with multiple road segments. Detour routes may be added to an issue, and will be displayed with a detour icon. Unmaintained winter roads, and spring load restrictions, can be posted for multiple roads as one issue, months in advance. Road segments display as lines, and Municipal511 features a follow the road mapping feature. Simply click at the start and end of a road segment, and the line will be created along the road. Additionally, Municipal511 will automatically describe the location or segment. E.g. “White Lake Road 22m Northeast of Green Meadow Road”. Polyline and polygons are also supported. Municipal511 is priced to municipalities by population. If a county or regional government purchases Municipal511, the lower-tier and single tiers serving the same population may use the service without additional fee. This unique pricing model aligns with Transnomis mission to map all road obstructions for emergency responders, and for municipal public works who also need to know what is going on in and around their municipality. Municipal511 can be purchased with Responder511 at a discounted price. For mapping, managing and communicating road issues; including roadwork, incidents, events, conditions, restrictions and cautions. Issues posted for public viewing are presented at Municipal511.ca , which can be embedded in client’s website. Public content can also be provided to Waze, and other navigation services. Email notification to distribution lists; with fax, SMS and Twitter options. Add-on options include Responder511, paperless permits, remote variable message sign control, and private map layers. Priced per population, and when purchased by upper tier, lower and single tier municipalities serving the same population are eligible for service as well. Responder511, a road information service for emergency responders and managers, that includes common operating picture features for use every call, every day, every incident and planned event. Fax, SMS, and Twitter push notification options. Remote variable message sign control.